Dead or Alive Dimensions is an interesting game. It's Tecmo Koei and Team Ninja's first 3DS game. It has polish, a surprising amount of depth, and it utilizes a lot of the 3DS features. It's a competent fighter that's a wonderful complementary title to go along with Super Street Fighter IV 3D Edition, but is it better? 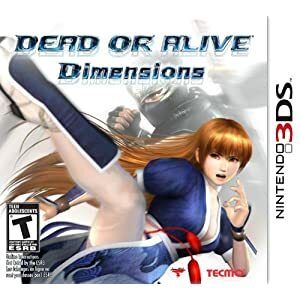 Dimensions isn't a canon game in the Dead or Alive series. It's more of an arcade all-star brawler that attempts to explain the story in Chronicle mode, a series of tutorial fights, still-frame dialog scenes and CGI cutscenes. For newcomers to the series, this is a great way to learn the mechanics of the game, but trying to tie the whole story together made it into one seemingly big mess. There are several other modes to play in Dimensions. Arcade mode is the most traditional of the bunch. 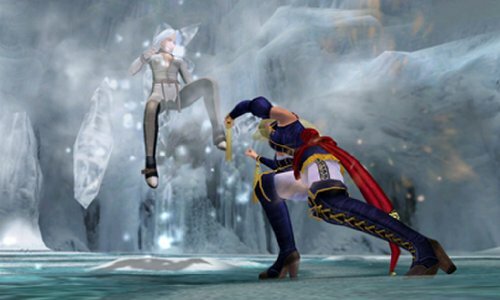 Use one character to fight through one of six set paths of opponents in one-round bouts. Tag Challenge pits you and one AI controlled ally against one or two opponents in a tag team match of sorts. Team up with your AI partner to do a team throw, or tag out when you're low on health to let them give you a hand. Survival pits you against between ten and one-hundred fighters. You recover some stamina between opponents, but there is very minimal rest. There's also local play (two-player local wireless), training and Free Play. Dimensions also takes advantage of SpotPass and StreetPass. If you pass someone else that plays Dimensions, you'll exchange a ghost fighter of sorts. The game will create a ghost based on your fighting patterns and will send it to passers-by. Any opponent you receive can be accessed by selecting Throwdown. Team Ninja also regularly utilizes SpotPass in two forms. First, staff members send out Throwdown opponents once a week. Second, the team sends out costumes for your characters daily. There are thirty-four in all, and they are regularly repeated. The environments can be dangerous if you're on the business end of an attack. For completionists, there are one-thousand mini-figures to collect for all of the various characters in the game. You earn one or two after completing Arcade, Tag Challenge, Survival, or a Throwdown challenge. You can take 3D photos of your mini-figures and save them to your SD card. Then there's the online mode. From my experience, it's smooth and relatively lag free, but it's very bare bones. There's no option to rematch your opponent when you finish, and there aren't any lobbies. There's also no way to communicate with your opponents, something the game could have used. Dimensions controls well. You can use the d-pad or the slider to move your fighter around the arena. Double tap forward to dash at your opponent, press up or down to dance around them (no jumping). Press X to punch, A to kick, Y to block, and B to throw an opponent. L and R do heavy attacks. Each character's movesets are displayed on the bottom screen, so you can see how to do their combos or touch the combination with the stylus and the character will execute them. I don't use it personally, but it makes the game accessible for newcomers. Almost every stage hides some kind of secret. Graphically, Dimensions doesn't disappoint. With the 3D off, the game runs at a smooth 60 FPS. The animations look good and natural as do the the interactive backgrounds. If you crank the 3D up, like with most 3DS games, the framerate drops. It doesn't make the game any less pretty, and it adds a good bit of depth. I prefer it on. Sound-wise, the voices are pretty good and the music and sound effects are pretty on-par with other fighting games. My only problem was that the English voices didn't sync well with the character's lips. It's a minor gripe that doesn't ruin the experience. Overall, Dimensions is a solid game that I recommend to fans of the genre. If you aren't into fighting games but want to give them a shot, then this is a good title to start with. I prefer it to Super Street Fighter IV 3D Edition, but both games are excellent and worth your $40 and your time. So, with the 3D turned on, is it a constant 30FPS? I think I'm a little tired of Street Fighter now, and wouldn't mind trying out a new fighter. Yes, it's a constant 30FPS with the 3D on. It's not like it looks bad if you never play with it off. It's different than SSFIV3D. There aren't many projectiles to dodge (a couple of bosses use them, and you can use the bosses once you unlock them), it's more of an up-close melee fighter...if that makes sense. I'd say give it a whirl. I bought it because I was bored of SSFIV3d too. I still need to get this game. It would be nice to have a fully 3-dimensional fighter to counterbalance SSFIV3D. Nice review, indeed. I kept telling myself to contribute and review a game, and this game would have been it - as it's the only one I've really "beaten" of late. However, now I don't have to worry about this any more! So, thank you! Haha. Light joshing aside, your score is the exact one I had in mind for this game. It is my most played 3DS game to date, and my go-to 3DS game for quick gaming bursts long after doing all there is to do in the game. It's just great fun. Online stinks, but that's really the only major con I can think of. I was hesitant about getting this game at first, and only caved when a buy two get one sale occurred. I guess I'm a prude and didn't like supporting a game such as this. But it's all in good fun I guess, so why not. The music is catchy and fitting, and the graphics (sans 3D) are pretty darn good. I prefer this game to Street Fighter IV 3D actually, which is weird to admit as I have always been quite the Street Fighter fan. I recommend this game to any and all fighting game fans. Given my being pleasantly surprised by Dead or Alive Dimensions, I am now anxiously awaiting the other game on the horizon from a fighting series I've yet to try, Tekken 3D Prime Edition. Nintendo systems are finally getting some quality fighting games again! I've been thinking about getting this game for a while now. Given all the awesome games coming out this fall, I think it'll have to wait a little bit more though. By the way, she kicks high! Who are your mains? My primary is Helena, secondary is Hitomi, and I use Kasumi and Hayabusa a good bit too. Yeah. SSFIV3D is a really fun 2D fighter, this is a really fun 3D fighter. I think they work well together. It's worth a purchase IMO, but I certainly understand waiting. Get it down the road though! It's too bad the online mode lacks so many features, even simple communication or lobbies. I can't wait to see a game that makes great use of online capabilities. Do you use the 3DS Play Coins in this game (like you could in SSFIV)? It's satisfying to see how the 3DS is already building up a nice solid library of fighting games! Yes, you can use Play Coins to purchase new mini-figures (I think it costs 10 coins a pop). I sometimes feel the game deserves a nine as well (given how much I play and enjoy it), but you are certainly right that it is flawed, and as such doesn't quite deserve to be so close to having a semi-perfect score. And I'm like you, I never rate games with anything but a .0 or .5. It just looks cleaner that way. And how does one really determine why this game or that game deserves that extra .1 or .2? Though, I'm really not fond of rating games with a number ranking. However, number scores do make for good reference points when accounting for multiple scores from various sources. Anyway, my main go-to fighter used to be Hayate. However, he's recently been dethroned somewhat by Eliot who is now my number one. It's funny, though, as I didn't like him at all at the start (especially in that goofy sailor costume! ), but now he's my favorite. He has one of the best music themes too, I might add. After Eliot and Hayate, I'd have to go with La Mariposa and Jann Lee as my third and fourth favorites/most used, respectively. 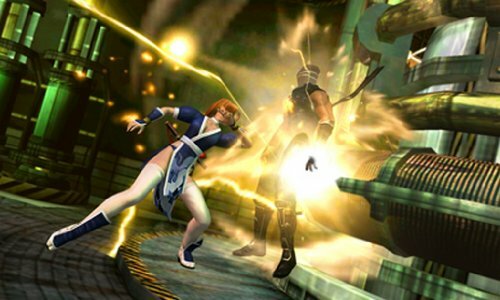 I'm warming up to Ayane, and would like to get better with Brad Wong. I also use Kasumi here and there as well. Oh, and I really like the multi level design of many of the stages, with the Lorelei stage being my favorite... I think. And as for the system voice I use Hayate and set the voices from the language menu to Japanese. After playing quite a number of matches I had all I could take with the cheesy, repetitive English character voices and am thankful for the option to mix things up. This review made me want the game more. Especially the ghost fighters and mini figures. I am disappointed that the story mode is such a mess. I was hoping it would be a good point to jump into the series story wise. This is honestly one of my favorite 3DS games. It's very well done and a lot of fun. It's not like it's terrible, there's just a lot of jumping and it doesn't do the best job of tying the whole thing together. It does make sense...just could have been done better. Agreed, and I generally don't like fighting games at all. Bumped. They're restarting the costume distribution (the same as the original DLC), so if you want to pick this up and get all of the original content, now's your chance!